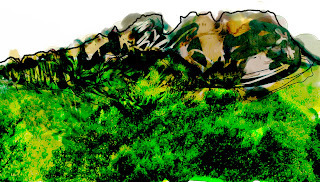 For this first week of wandering the territory of Arles-sur-Tech, in the Pyrénées, I am drawing the mountains. A simple step to understand the landscape before I plunge into the esprit, the ethereal bits of culture and history that will somehow become evident to an outsider. These are the mountains of borders. The mountains that Jews had to cross to be saved from the Nazis, and the mountains that Spanish revolutionaries has to cross in the other direction to be saved from their own terror. The only other route - the sea - is not far - an hour by bus to Perpignan, known as the site of despair, where Walter Benjamin gave up his quest to cross. For now, the mountains are just the mountains, while I digest the rest. technical info: drawing in new Painter 12 using Wacom bamboo tablet, combined with digital photographs.. Final combining in Adobe Photoshop, but glad to have Painter as an alternative. I went to town to buy paper yesterday, and then decided to stay all electronic for now! This is wonderful.. the context, the drawings....WAY TO GO!! cynthia, it sounds exciting to contemplate the contextual (social, etc.) 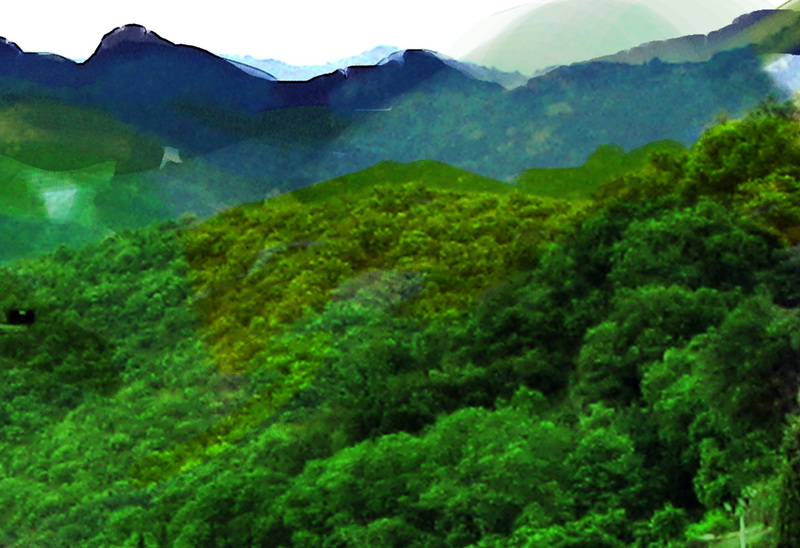 colors of the landscape.